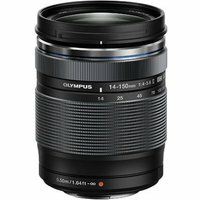 The Olympus 14-150mm f4.0-5.6 ED II lens offers Micro Four Thirds users the flexibility to shoot everything from wide-angle to telephoto. Lightweight and portable with a dust- and splash-proof design, the Olympus' exclusive MSC "Movie and Still Compatible" lens drive is not only lightning fast for reliable and instant auto-focusing, it is virtually silent. So whether you are shooting movies or stills, the lens will not generate intrusive noise.